The project “Map hunter” expanding its geography, we continue the development of the North-Western regions of Russia. In the course of work processed GEODATA about hunting one of the most beautiful Northern regions of Russia — created and published an interactive web map of the hunting grounds of the Republic of Karelia. 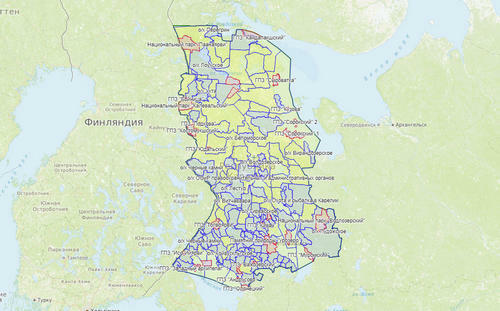 Interactive web map of the hunting grounds of the Republic of Karelia made in accordance with a raster map of 2017 from the Scheme of territorial concerning organization of haunting the region, approved by the Head of the Republic of Karelia, dated October 30, 2015 N 373-p “On approval of the layout, use and protection of hunting grounds on the territory of the Republic of Karelia”. Interactive map added all new hunting enshrined in the auctions in the period from 2015 to 2018, included all known updates and refinements. When you create a map based on the official open data on the boundaries of hunting grounds, protected areas, zones of protection of hunting resources, and other areas of public resources. The composition of the map also includes the border 22 of the Federal nature reserves and regional reserves, hunting of which is prohibited or restricted. In addition, for the Republic of Karelia is characterized by the presence of a number of zones of protection of hunting resources — green areas, especially around large settlements, where the exercise of hunting is also not allowed. Maps of the hunting grounds of the geoportal “Map hunter” are created in the form of a web geographic information systems (GIS) and are available for online viewing on any device with Internet access. Attention hunters, fishermen and tourists! Map of the hunting grounds of the Republic of Karelia is available in a dedicated navigation mobile application “Map hunter” for devices on Android and IOS platforms. The app provides accurate navigation in the area, geotracking and the creation label of the user on the map. Crossing the boundaries of hunting grounds and territories to ban hunting, the user gets a notification. Also available in the application of alternative background maps. To choose connect topographical maps of the “General staff”, space images Google, etc. the Selected maps are available offline without Internet after downloading to the device. Subscribers to the app available legal information on the timing and methods of hunting in Karelia. Suggestions, comments and new information please send the mail admin@huntmap.ru or use the feedback form.